Strong storms claimed the lives of three members of a canyoneering party at Zion, and four others are missing. Here’s the latest from the National Park Service. Rangers at Zion National Park in Utah received a report of a group of seven people canyoneering in Keyhole Canyon shortly before the flooding began Monday, Sept. 14. Their unoccupied vehicles were located on Monday evening and a search began the morning of Tuesday, Sept.15 when it was determined that these individuals had not exited the canyon. According to the National Park Service, storms arrived between 4:30 and 5:30 p.m Monday and dropped 0.63” in Zion Canyon in one hour. As a result of these local storms, flash flooding occurred in the park including Keyhole Canyon. Zion National Park was alerted to an injured canyoneer in Heaps Canyon mid-day on Saturday, July 12th. The 24-year-old Las Vegas man had apparently taken a 100-200 foot un-roped fall into a side canyon at approximately 7 p.m. the previous day. Three companions descended to him; one stayed with the injured man while the other two members of the party continued on through Heaps Canyon to get help. Heaps Canyon is a strenuous, challenging technical canyon with an approximate 3000-foot descent. It usually takes 12 to 20 hours to complete, consists of a number of rappels into cold water, and ends with a final 280-foot rappel to the Upper Emerald Pool area. Here’s a follow-up the the National Park Service valor awards we wrote about a few days ago. Also earning the award, the highest for park service employees, were two Zion rangers who rescued an upside-down climber in 2010, and Joshua Tree National Park staff who responded to a plane crash in 2011. Springdale, UT- In recognition of their quick actions and willingness to place themselves in positions of danger in an effort to save the life of another, Zion National Park Rangers Craig Thexton and Therese Picard are receiving Department of Interior Valor Awards. The incident that is being recognized took place on the evening of April 30, 2010, after Zion National Park dispatch received a report that a canyoneer was in distress on the final rappel of Pine Creek. The reporting party stated that a member of his party had lost control while rappelling, was hanging upside down, and was unable to right himself. The Pine Creek canyoneering route travels through a deep, narrow canyon and requires five rappels. The final rappel is 90 feet long and free hanging. After completing the final rappel, canyoneers must walk and scramble ¾-mile to reach a road. The one-mile long Zion/Mount Carmel tunnel parallels the rappel route and one of the tunnel windows is 200 feet above the anchor for the final rappel. Rangers immediately recognized the life threatening nature of the situation. Rangers Ray O’Neil, Craig Thexton, Therese Picard, and Dan Hovanec responded to the tunnel window. They rigged a lowering system and a belay line and lowered Thexton and Picard out of the tunnel window 200 feet down to the subject. 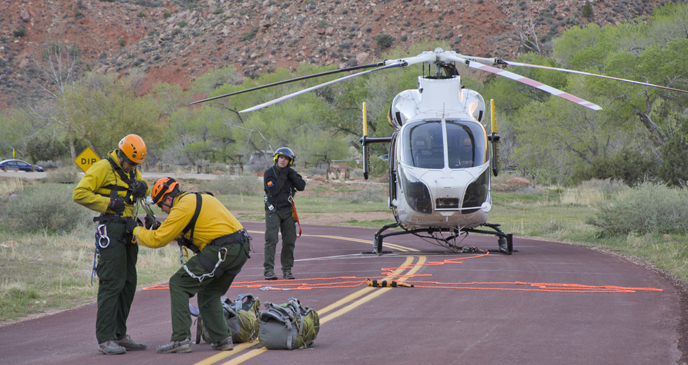 Search and rescue crews prepare for a recovery mission at Zion National Park. Photo courtesy National Park Service. At approximately 11:00 am, March 25, 2014, a search and rescue team consisting of members from Grand Canyon National Park, Zion National Park, and several volunteer climbers recovered a BASE jumper’s body from the West Temple area. He was identified as 38-year-old Sean Leary from Sacramento, Calif.
Leary was last heard from on March 13. According to his family, he was planning on BASE jumping from the West Temple that evening and then was to join a group rock climbing in the park the next day. The climbing team never saw him. On Sunday, March 23, the family notified the park of the overdue BASE jumper and the National Park Service started to search. With the help of the Grand Canyon helicopter, Leary was located in an area called The Three Marys, approximately 300 feet below the ridge of the tallest peak. Harsh winds suspended all recovery efforts Sunday. After spending Monday assessing options, planning the recovery, and closely monitoring the forecast, the combined SAR crew started the recovery at 7 am Tuesday. The recovery involved short-hauling two rangers to a ledge above Leary. They climbed down, began the accident investigation, and secured Leary for a long-line haul via helicopter off the peak. Leary was an internationally known climber and BASE jumper. He was well respected within the climbing and BASE jumping community and many friends and family came to Zion National Park after hearing about the accident. Several of his experienced climbing friends were on standby to help move Leary to the top of the peak in case the helicopter had trouble reaching him. They also helped SAR rangers manage lines set up to reach Leary. Lyle Dale Hurd III, age 49, of Santa Clara, died Friday afternoon, Oct. 26, 2012, after taking a fall while climbing in Zion National Park. The cause of the incident is currently under investigation by the Washington County Sheriff’s Office in cooperation with the National Park Service. Hurd was in a party of four individuals on the Northeast Buttress route, a popular climbing route below Angels Landing. The group was traveling in pairs and Hurd and his partner were following the other pair up the route. Hurd was leading the fifth pitch when he fell over 40 feet onto a ledge pulling his top piece of protection out. His partner witnessed the fall and called 911 before providing medical care to Hurd. Twenty members of the Zion Search and Rescue Team responded. When Park Medics reached the ledge, they confirmed that Hurd had not survived his injuries. The SAR team worked through the night to evacuate the body and investigate the fall. Located below Angels Landing, the Northeast Buttress is an eight pitch big wall climb that is rated at IV 5.10+. This was Hurd’s first time climbing this particular route although he was an experienced climber and had completed several big wall climbs previously in Zion National Park. This is the second fatal accident in the park for 2012 and the seventh climbing fatality since 1983. Zion National Park Rangers rescued canyoneers overdue from a hike Tuesday, Oct. 9, three days after the pair started what was to be a one-day trip, according to National Park Service officials. The two hikers, a 41 year old man and a 26 year old female, were attempting Heaps Canyon, one of Zion National Park’s more difficult canyoneering routes. Heaps Canyon is eleven miles long and involves a 300 foot free hanging rappel, swimming through cold water, and numerous other obstacles, including slick rock potholes which can be difficult to traverse. At approximately 9 a.m. on Saturday, the pair picked up their wilderness permit and said they estimated completing it in a day. The park ranger notified them that most people start pre-dawn in order to make Heaps Canyon a day trip. The pair said they were prepared to spend the night if necessary. While the two were never reported overdue, rangers did note that their vehicle was still parked at a trailhead on the morning of the Monday, Oct. 8. A helicopter from Grand Canyon was called in for the search. The helicopter crew located the canyoneers in the lower reaches of Heaps Canyon late Monday afternoon. After three days of travelling, the two had only completed about two thirds of the canyon, and some of the canyon’s most difficult obstacles still lay ahead. The crew was able to get a radio to the pair who stated that they were not able to complete the canyon without assistance. On Tuesday morning, a ranger and firefighter were inserted to a bench above the two canyoneers. They cleared a helispot which enabled the helicopter to land with additional rescuers. The six member rescue team lowered a ranger from the bench 125 feet down to the stranded pair and then hauled all three people back to the bench. The two canyoneers did not require medical assistance. The successful conclusion to the search was in part because the hikers had obtained a backcountry hiking permit which included information useful to the searchers. However, wilderness hikers should always inform someone of their plans along with an expected completion time. Had rangers not noticed the canyoneers’ vehicle at the trailhead, it is unclear when or if the two would have been reported overdue. The group also had far less experience than most Heap’s Canyon travelers, park service officials said. While canyon hiking (canyoneering) in Zion can be a challenging and rewarding activity, it is not one that should be entered into lightly, according to NPS officials. UTAH — The National Park Service identified the person who died while canyoneering in Zion National Park as Yoshio Hosobuchi, 74, of Novato, California. He and his wife attempted to descend the Left Fork of the North Creek, a popular route known as “The Subway” on Tuesday, Sept. 18, 2012. On the last rappel in the canyon, Hosobuchi’s rappel devise jammed and he ended up hanging inverted in the waterfall and was unable to free or upright himself. His wife, who was already on the canyon floor below, was unable to assist him. A canyoneer from another group that just completed the Subway the same day, called park dispatch at 9 p.m. to let them know that there was a couple still behind them. The group had passed the couple earlier in the day and knew that at their current pace, they would probably have to overnight in the canyon. Based off that report, rangers began looking for the overdue couple on Wednesday morning. At 11:45 a.m., a ranger located Mrs. Hosobuchi, who was trying to get out of the canyon to find help. A search and rescue team hiked into the Left Fork and located his body Wednesday evening. Due to approaching darkness, his body was evacuated by helicopter Thursday morning. Hosobuchi was a retired Neurosurgeon. He is survived by his wife and three children. Over the last few years he and his wife have been traveling and completing a “bucket list”, which included completing the Subway. Last year he successfully hiked Kilimanjaro. The Hosobuchi’s were relatively new to canyoneering. Their only experience had been an introductory course and completing a trip through Zion National Park’s Keyhole Canyon. Unfortunately they hadn’t mastered route finding and might not have had all the skills necessary to get out of trouble while rappelling. Without looking at the route guidance they brought, the couple chose to an anchor that forced them to rappel down the waterfall rather utilize the anchor listed in the route description. Rappelling in a watercourse increases the difficulty and may have contributed to Hosobuchi’s death.